It is International Cat Day 2018! Great products for cats can make even the toughest cat problems a breeze and help pet parents adopt more kitties that need homes. 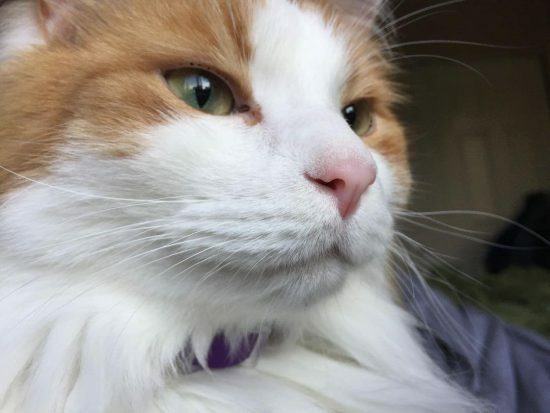 This is the goal of ThrivingCat.com, to help pet parents feel confident to take care of their cats and adopt those in need. So Happy International Cat Day! I have a French Chartreux, a Norwegian Forest Cat, an American Short Hair and a Calico kitty. We are truly a home of international kitties! The amazing part of this is that all 4 were rescues! The French Chartreux in particular is a very rare breed! Don’t assume you need to buy a cat from a breeder! Great, intelligent, loving cats of every breed need homes. Would you adopt a cat from a shelter or rescue group if you felt confident to take care of health and behavior problems? Here are my personal reviews of products from preventing behavior and health problems to cleaning up messes! Whether your cat scarfs down food too fast, eats too much or has a food that is too fattening, I have solutions. Cat Food Puzzle Feeder, Here is the food that my cats eat. It is made with Alaskan fish, low in fat and grain free. They love it and it helps keep the weight off. What is the Best Natural Cat Food? Do you have a kitty that throws up often? Don’t believe the popular mythology that this is normal or “just hairballs”. It is not normal and can be treated with this! Remedy for Cat Vomiting, and try this cat food that finally fixed my cat’s food sensitivity, What’s The Best Cat Food For Sensitive Stomachs? Do you want a solution for peeing outside the box? Here are solutions I have found that work! 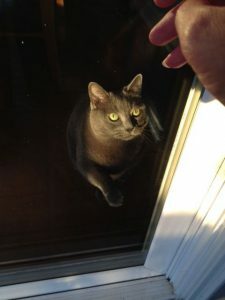 Jackson Galaxy Safe Space for Cats Drops, and How To Stop a Cat From Spraying, This Works!, as well as Sentry Calming Collar For Cats Review. Are you concerned about your cat’s teeth? Do you know their teeth should be brushed but you would like to find a better solution to prevent expensive and painful cleanings and extractions and anesthesia? I found a solution with no brushing and no sprays! This same supplement for gums and teeth works for keeping your dog’s teeth clean too! You can use the same bottle for cats and dogs! Check it out here: Revolutionary Supplement Keeps Dog and Cat Teeth Clean. Do you need a way to treat cats with ever common upper respiratory infections (kitty colds)? Here is a supplement we use for our kitties every day. Just mix into wet food. This supplement is made for dogs as well! Home Remedy For Cat Colds. Do you need an affordable, sturdy and tall cat tree that doesn’t break the bank? Here is your answer! Check out my review here: Cat Trees for Large Cats. These are the cat trees with the best value I have found and the kind I have for my cats. Clean Cat Pee, Dog Pee or Kid Stains! Are you stumped by how to clean cat pee…or dog pee? Here is a great method to clean those stains or any others (kids?) from carpet, clothes and more! Please check out: How To Clean Cat Urine in Carpet, or for a review of the whole process including getting an affordable and powerful black light to find stains, check out, Cat Urine Odor Removal Easy Steps and for a new, quick, easy method, Remove Cat Urine Smell in Clothes. Pine litter is so much better! It is naturally anti-bacterial, repels insects (unlike corn, wheat and litters), is flushable, controls odor and is SO MUCH EASIER TO CLEAN out of the cat box! It doesn’t make a sticky, glued on mess! What Is The Best Cat Litter For Odor Control? Please leave a comment or question about any other cat products you are looking for or problems you may have. Take advantage of these easy solutions and celebrate International Cat Day! Thank you Clifford. I hope your site does well in the future! I just finished your article on International cat day and I think it was wonderful to know just how you improve your cat’s well being just by taking the proper amount of steps to maintain and love your animal. Thank you for this information. Thank you! Yes, it is amazing how having a cat can go from stressful to easy if you just have the right products! I was so relieved when I found these supplements and other cat products that actually work. Jessica, this and your other posts are awesome! We had a Bengal (2 to be exact) and because they’re very close to a wild cat, their cat box stunk like no other. We’ve had plenty of cats in our time, but this was something else. If you didn’t get to it right away, it could clear the basement (so to speak). I’m glad you mentioned the litter and keeping it clean, as that’s a big part of a happy cat and happy cat/human relationships! I understand the stink. My Norwegian Forest Cat has the very bad habit of not burying! I don’t know why but he buries number 1 but never number 2! Sometimes I consider a self scooping litter box but we have not tried it yet! Perhaps someday I will have a review of one here! Cats are some of my favorite animals, independant and full of attitude. I’ve always had a kitty in my life and they have always brought me much joy. I agree. Cats are unique, beautiful and interesting pets but most of all they are loving and wonderful friends. Actually this is exactly the information that I was looking for about international cat day and when I landed to your website and read this post, it answered all my questions in details. So I’m happy that you decided to write about this topic and share it with people. It’s very useful and can definitely be used as a great source for international cat day. I am glad you found the information you were looking for here. International cat day seems like a great time to learn how to take better care of cats and consider adopting one. Thank you for stopping by, and I hope you visit again. Wow! You have a French Charteux? That is a very lucky find to discover at a cat shelter. I am sure you are treating her well and giving her lots of love. All shelter cats need love. I used to have a cat I picked up from a PetCo on Adopt a Cat Day. She was so sweet. She used to be owned by a woman with cancer, so she got pet a lot. It was no different when I brought her home. Unfortunately, she was old, arthritic, and tumorous, so she had to be put down but she brought a lot of joy to my life for the time she was with me. It is good to hear someone else enjoying their shelter cats. I appreciate you for sharing in your article. Thank you Alex! We have been so happy to find 4 wonderful cats all from shelters and rescue groups. They are all sweet and loving. Our most recent kitty is the oldest at 14. We have only had her a few months but she is amazingly healthy. The vet was impressed. She even has good teeth which is unusual at that age. I am so sorry you lost your girl. That is really sad. It is nice you gave her a good home though. Our French Chartreux girl is a total princess. She acts like she is queen of the house. I can’t imagine how she ended up in the pound on death row. Thank you for adopting cats!